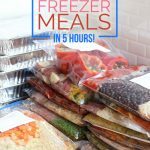 Two of my most popular blog posts are 1) a list of gluten-free crockpot freezer meals and 2) a free grocery list for six freezer meals from ALDI. 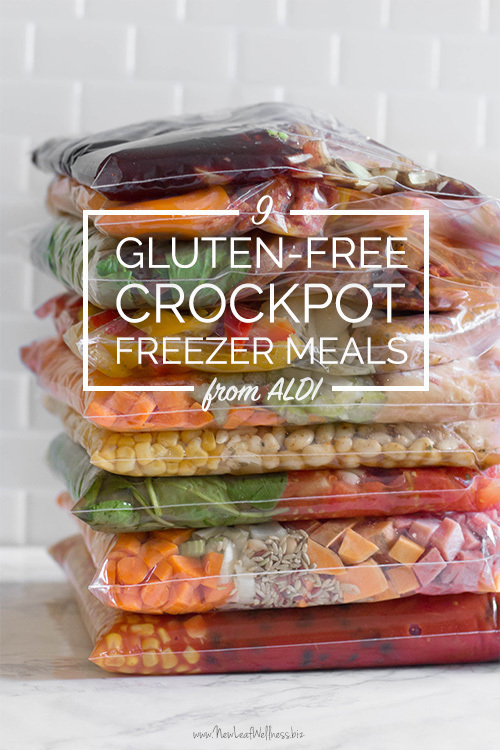 So, I decided to combine those two things and make a bunch of gluten-free freezer meals from ALDI. Genius, right? Since I have a lot of great crockpot freezer recipes, I didn’t plan out what I was going to make ahead of time. I drove to ALDI and got inspired by what was available in store. I started by picking the very best meat (for example, all-natural chicken breasts and organic grass-fed ground beef) and then looked at the fresh produce to decide which recipes to make. 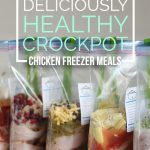 What so great about these crockpot freezer meals? I only spent $85 on groceries ($9.44 per meal). All of the recipes were healthy and delicious! 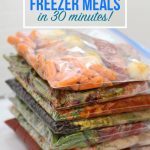 My husband took our four kids out of the house, so I actually enjoyed making these meals. I listened to music on Pandora, and drank sparkling water, and thought about how productive I was being. Then everyone came home and I went back to crazy-mom-mode, but those 90 minutes were bliss. I did all of my grocery shopping ahead of time and printed the recipes. 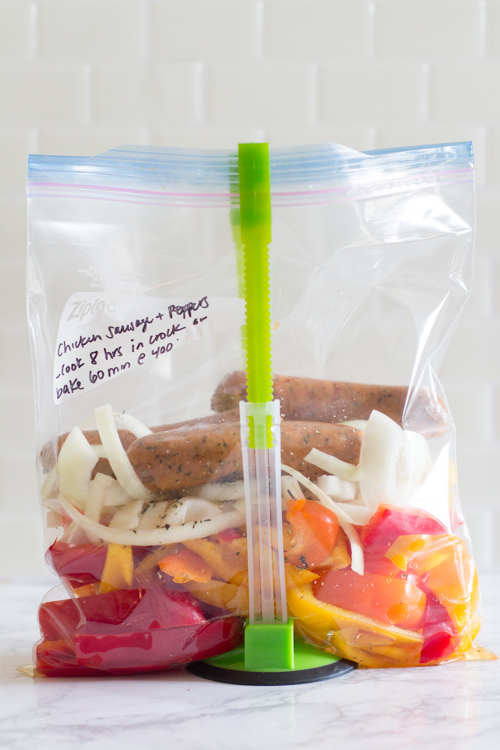 I labeled my freezer bags with a Sharpie marker. I got out all of the ingredients and organized them like this: produce with a cutting board next to the sink/garbage disposal, canned goods and spices next to that, and meat in the fridge. Then, I filled the bags in an assembly line in that order. It took awhile to get through the produce, but then it was smooth sailing. I used these baggy racks to hold my freezer bags upright (super helpful) and chopped everything with my all-time favorite chef’s knife (it’s actually the only knife that I bought since our wedding, but it’s amazing). I chopped all the onions by hand, but about half-way through I was wishing I used my chop wizard, so if you have one, I recommend using it. 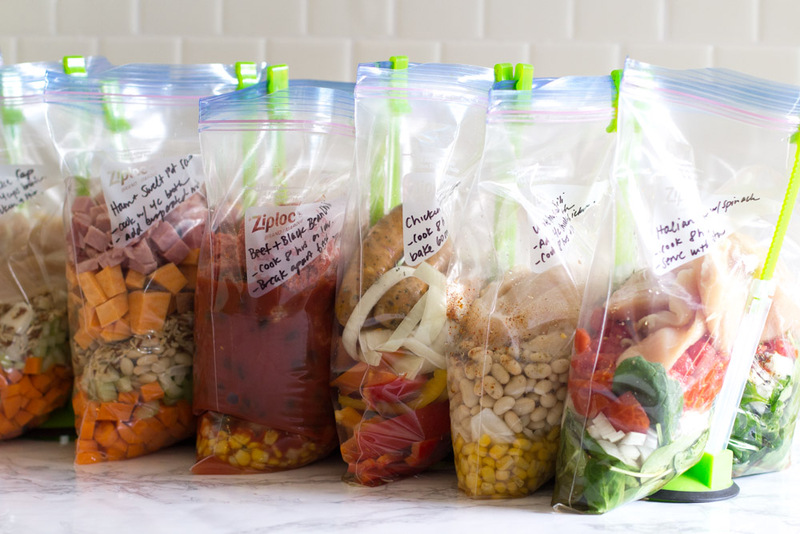 I added as many tips as I could to the printable recipes above. We already ate three of the meals and loved them, so I know you’re going to love them too. Yum! This looks so delicious! Thank you, it must have taken you quite a bit of time to put together. Thanks for being so generous with your time. I prepped these today and can’t wait to try them! One quick question: if you cook in the oven like some of these had the option of doing, do you thaw the meal first? Or are the oven instructions assuming you start from frozen? Thank you!! I just finished the shopping and will be prepping tomorrow. With there only being two of us, this session will make 18 dinners! At roughly $105 that comes out to under $3 per person per meal. That’s like. . . a freaking Happy Meal! Weeknights, I can be just as lazy and cheap, but the food will be so much better for us! Recipes sound great. 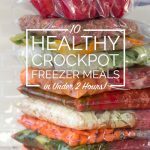 Love the idea of crock pot cooking. One question how do you make the meals for one person. I have gotten where I hate to cook because I end up eating the same thing for days. 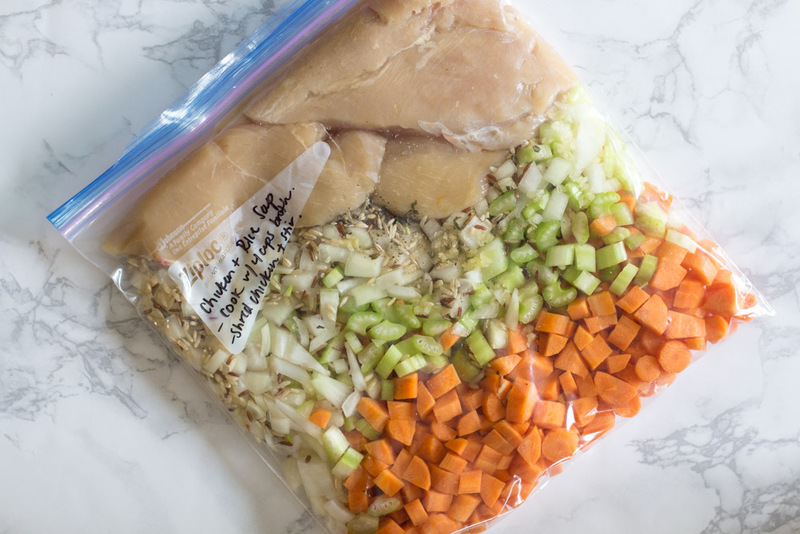 I would split each recipe into two freezer bags and cook in a smaller crockpot (2-4 quarts).